Leadership includes the ability to comprehend how one’s action in achieving goals. Hence, this workshop aims to advance and demonstrate leadership skills and team experiences, thereby, creating an exponential change for themselves and other. The program is fully funded to 24 applicants. 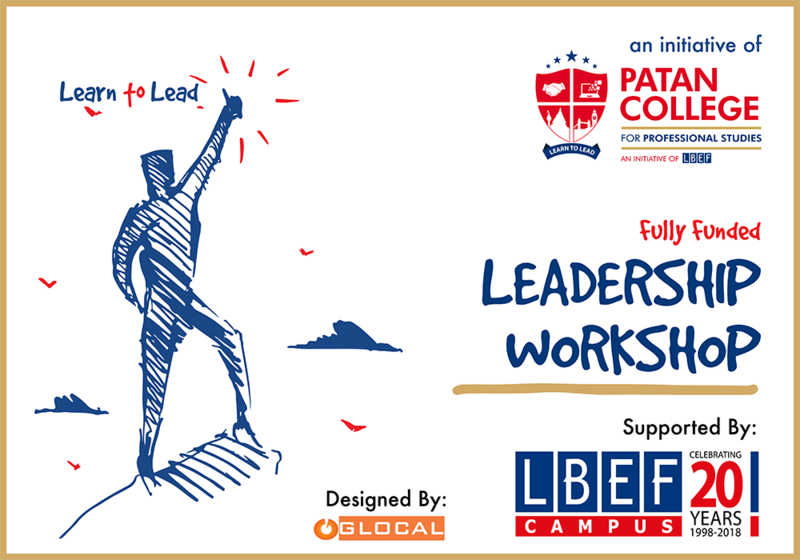 The program is an initiation of Patan College for Professional Studies, supported by LBEF and designed by Glocal Pvt. Ltd.
Only one application per person is accepted. The application cannot be revised once submitted. Hence, applicants are requested to fill the form wisely. Please make sure that the personal information and contact details are submitted correctly so that we can contact you if you are selected. The photos and videos of the workshop will be published in media and displayed in partner organization’s social media channels. This will be done by signing the media release form once selected. Selected applicants have to reach venue by themselves. Documents can only be uploaded as a Microsoft Word document (.doc or .docx) or in PDF format (.pdf). The selection is based on the portfolio and reasoning answers of the participants. Program Date: February 11, 2018. 0 responses on "Leadership Workshop (Fully Funded)"